After two weeks watching dramas and documentaries (most of them with subtitles) at the San Francisco International Film Festival, I felt it was time to reconnect with another aspect of cinema. So I visited a multiplex and caught The Amazing Spider-Man 2–in 3D, no less. This is the sort of summer movie that makes you forgive Hollywood for its current excesses. Sometimes, the excess is worth it. I didn’t bother seeing The Amazing Spider-Man two years ago; bad reviews kept me away. But having seen all three films in the first Spider-Man franchise, plus knowing a few things about the original comic strip (my son is a huge Marvel fan), I felt I didn’t need to see the reboot movie first. Besides, the sequel has received much better reviews. I made the right decision. I love this movie. The Amazing Spider-Man 2 is a big, splashy, fun, CGI-heavy action flick with a small, character-driven independent art film hidden inside. Peter Parker (Andrew Garfield) is a teenager in crisis. His parents deserted him when he was young. His girlfriend is about to desert him. A now-powerful old friend is putting him in a moral dilemma . The widowed aunt who’s raising him (Sally Field) can barely make ends meet. And because he has superpowers, he feels responsible for stopping all the crime in New York City. The film ties all of these conflicting emotional issues into a whiz-bang action ride. You never feel as if the personal story is just there to fill in the spots between special effects. Nor do you feel that director Marc Webb and his team of screenwriters reluctantly added action scenes to please the suits. All the pieces fit together. If you take away one action scene, or one quiet moment of reflection, everything would fall apart. I can think of only one other superhero movie that balanced the personal and the spectacular so well: Spider-Man 2–the sequel to the first Spider-Man feature film. I don’t know if that’s a coincidence. 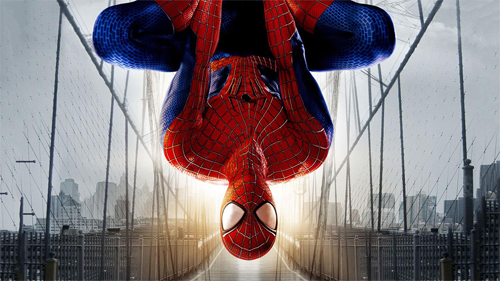 Interesting technical fact: The Amazing Spider-Man was shot digitally in 3D–pretty normal for a modern special effects action movie. But this sequel was shot on 35mm film, and artificially converted to 3D in post production. I don’t object to that the way I did when they converted Titanic and The Wizard of Oz. The picture was designed and shot with the intention of 3D conversion. Besides, the really impressive 3D effects weren’t "shot" in the normal sense of the word. They were all CGI. But it does leave me wondering. In 1953, Hollywood was routinely shooting 3D movies on 35mm film. Why can’t they do that today?